Missed the opportunity to grab yourself some Echo hardware running up to this day? Don’t panic, as Amazon has discounted its hardware in a swift manner today, ensuring that you become a proud owner of Alexa hardware without spending too much money. We have three deals in total here. One on the 3rd-generation Echo Dot, the 2nd-generation Echo smart speaker as well as the Echo Dot Kids Edition hardware. Once you part ways with your money you get a high-quality speaker which packs Alexa under the hood which can be utilized in a wide variety of ways. You can control your smart home, provided you have compatible hardware, or you can ask away those troll questions which you’ve planned for the day when you received your first ever Alexa smart speaker. 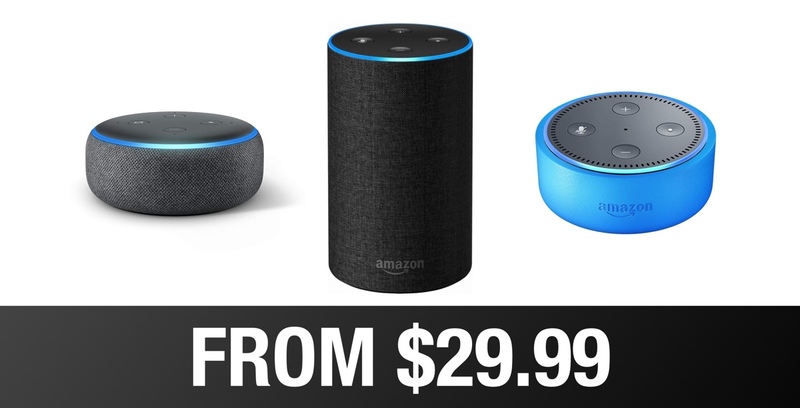 From the bunch, the 3rd-generation Echo Dot is a very, very amazing deal since it packs a lot of features in an extremely small package that looks exquisite. We’d go as far as saying that you should pick up two of these and spread them across your house if you need the ultimate smart assistant experience. Or, you can just buy the regular Echo speaker and call it a day. Besides, it packs amazing audio output and ties in nicely with Amazon’s own entertainment services and now Apple Music. If you are interested, you can pick up the deals from the links below. Just make sure that you have that credit card handy before going ahead.